These sweet angel cookies are as much fun to make as they are delicious and cute. The kids will really enjoy making them with you. One of the best parts about the holiday season is making batches and batches of cookies. I love coming up with new recipes each year to tempt my family and friends. These cute little angle cookies are simple to make and really set a holiday mood, to remind us of the reason for the season. To make the cookies you will need to first make the bodies and then decorate the cookies with twisted pretzels, frosting and colorful wafer cookies or round gumdrops for the heads. 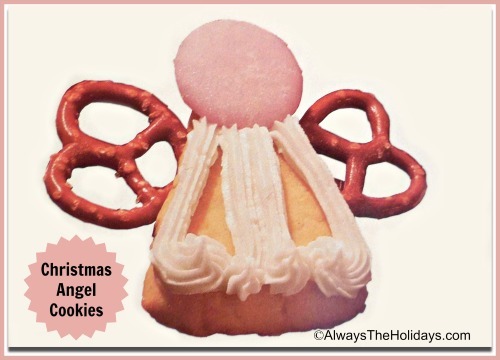 These cute Christmas angel cookies remind us of the reason for the season. Preheat the oven to 325 ºF. Beat the butter with an electric mixer for 30 seconds until it has softened. Add the sugar and continue beating until it is fluffy. Stir in the orange peel and orange juice. Switch the mixer to low and gradually add in the flour and baking soda. The mixture will resemble coarse crumbs. On an ungreased cookie sheet place one tbsp of the dough and form it into a triangle. about 2 1/2 inches long and 2 inches wide. Continue making other triangles until the dough is used up. Bake for 10-15 minutes until the edges are firm and lightly browned. Lift to a wire rack and cool. Meanwhile, make the frosting. In a small mixing bowl beat the shortening and vanilla for about 30 seconds. Gradually add in one cup of the powdered sugar and 1 tbsp of milk. Continue to beat, gradually adding in extra powdered sugar to make about 1 cup of frosting. Add a bit of frosting to the top of the triangle and under the back "shoulders." Attach the wafer head and two pretzel wings. Pipe some frosting on to the body of the angel to make the dress. Allow to set. Makes 20 angels.